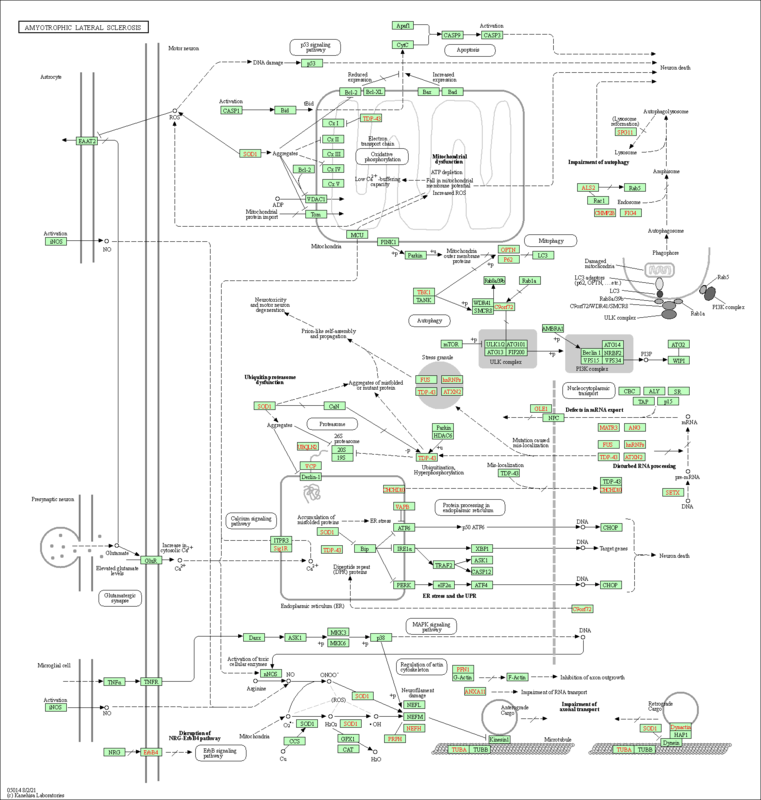 Here I will collect links to flowcharts representing the pathways that are relevant wrt. ALS. The pictures are links to the original sites where the pictures open in full resolution. Amyotrophic lateral sclerosis (ALS) is a progressive, lethal, degenerative disorder of motor neurons. The hallmark of this disease is the selective death of motor neurons in the brain and spinal cord, leading to paralysis of voluntary muscles. Mutant superoxide dismutase 1 (SOD1), as seen in some familial ALS (FALS) cases, is unstable, forming aggregates in the motor neuron cytoplasm, axoplasm and mitochondria. Within mitochondria, mutant SOD1 may interfere with the anti-apoptotic function of Bcl-2, affect mitochondrial import by interfering with the translocation machinery (TOM/TIM), and generate toxic free radicals (ROS). Reactive oxygen species (ROS), produced within mitochondria, inhibit the function of EAAT2, the main glial glutamate transporter protein, responsible for most of the reuptake of synaptically released glutamate. Glutamate excess increases intracellular calcium, which enhances oxidative stress and mitochondrial damage. Mutant SOD1 can also trigger oxidative reactions , which can then cause damage through the formation of hydroxyl radicals or via nitration of tyrosine residues on proteins. Nitration may target neurofilament proteins, affecting axonal transport. Collectively, these mechanisms are predicted to disturb cellular homeostasis, ultimately triggering motor neuron death. Interference with normal proteasomal or autophagic protein degradation is caused by mutations in superoxide dismutase 1 (SOD1), valosin-containing protein (VCP), ubiquilin 2 (UBQLN2), charged multivesicular body protein 2b (CHMP2B), optineurin (OPTN) and, potentially, TAR DNA-binding protein 43 (TDP43) and FUS (amyotrophic lateral sclerosis (ALS) as a proteinopathy; shaded yellow). Disturbance of normal RNA processing, which yields erroneously assembled proteins and toxic RNA species, is caused by mutations in chromosome 9 open reading frame 72 (C9ORF72) and potentially TARDBP, which encodes TDP43, and FUS (ALS as an RNopathy; shaded purple). Through both gain- and loss-of-function mechanisms, these primary pathogenic changes result in progressive cellular failure (shaded light red) that is characterized by protein clumping, aggregate formation, endoplasmic reticulum (ER) stress and Golgi and mitochondrial failure. Axonal architecture (cytoskeleton) and function (transport) fail, and axonal retraction results in denervation of neurons (such as the lower motor neuron) or muscle. Non-neuronal cells modify this process through the loss of their normal effect on the neuron and/or the gain of a toxic effect. Vulnerability factors such as stress response capacity (for example, by the capability to activate heat shock proteins) and susceptibility to excitotoxicity (for example, through the permeability characteristics of the glutamate receptor) determine (or co-determine) which neurons are (mostly) susceptible to these processes. Some ALS-causing mutant proteins may act more downstream in this model (for example, profilin 1 and neurofilament heavy chain (NFH) through a direct effect on the cytoskeleton and D-amino-acid oxidase on excitotoxicity). Axonal attraction systems (for example, semaphorin and vascular endothelial growth factor) and repellent systems (for example, NOGO and ephrins) appear to modify the processes of axonal retraction and denervation. My master working document in which I am attempting to include all aspects of the disease to facilitate better understanding. Explanations are here. A really good semantically intelligent search engine for exploring Pubmed. Currently the most advanced stem cell research project against ALS. An ongoing project to map a large number of PALS' DNA profiles.